Ya Jagoff!!! | Baseball Bull Pen Carts are Back - Diamond Backs are NOT Jagoffs! 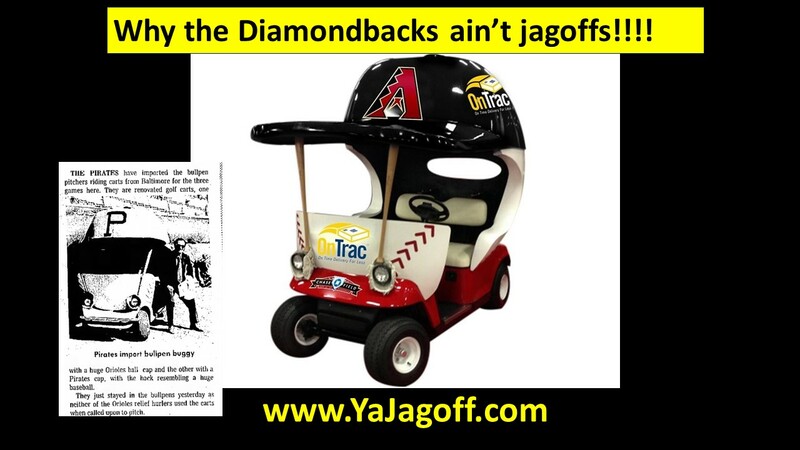 Home Baseball Jagoffs Baseball Bull Pen Carts are Back – Diamond Backs are NOT Jagoffs! While I was a total fan of the Jared Hughes run from the bullpen to the pitcher’s mound, (I always wanted to challenge him to a run down the grocery store frozen pizza aisle) Check this out… I kind of remember these things and, my memory is, they were awesome! No idea why these things are coming back! Some say it is to speed up the game but, I doubt that! I think it’s more of a factor of baseball park grass cutters and field groomers are getting older and need jobs… so.. instead of them leaving baseball and becoming door-openers and door-holders at local funeral homes, driving the bullpen golf carts are making a comeback. Next articleWe Made a Late Night Move! Ain’t Just Pitchers’ Elbows On Ice at the Bucco’s House!